I recently traveled to Ontario to attend some meetings that pertained to my seed business. I had a great time and was hosted by some great companies and people. The real treat was getting to spend some time with local retailers and farmers from all over Ontario. I always enjoy spending time with farmers and agribusiness people from different trading areas than my own because it gives me a chance to ask questions and learn. 1. No single desk selling on wheat – This is super obvious and throws boat gas on any anti-wheat board westerner. One person told me that nothing puts Ontario farmers to sleep faster than westerners talking about the Canadian Wheat Board. The Ontario wheat market is much smaller than the west€™s, but still it makes no sense to me that this difference in marketing control has transpired. Ontario also rid itself of KVD much sooner than the west did. Apparently the Ontario wheat market is able to convince politicians to enact change much better and faster than their western farmer colleagues. Whether you are in favour of a single desk or not, it is incredibly strange that only certain regions of the country are forced to sell its wheat to a single desk entity. 2. Firmer understanding of IP markets – Due to the identity-preserved (IP) market for non-GMO edible soybeans, I find that Ontario farmers have a better grasp of quality systems and the direct impact that they have on the customer. 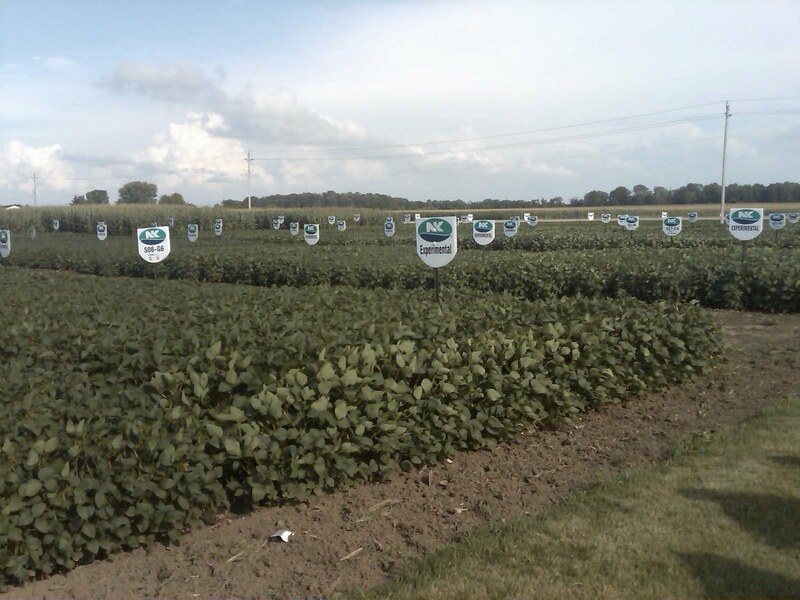 The west does access some special crop markets in IP systems, but the soybean business is much different. Even in the wheat market in Ontario, it seems that farmers are more experienced in talking to millers. One great example was the package of whole-wheat pasta made from Ontario-grown durum that I received from my friend Archie Wilson at C&M Seeds. That€™s right, Ontario durum. C&M developed a pilot project with some growers and a miller to create a locally-produced Ontario pasta product. 3. Smaller farms – Western agriculture is much bigger in farm size due to the wide open prairies. Big Ontario farms are in the 1,500- to 3,000-acre range, not the 15,000-acre range. This is partly due to the massive difference in the cost of land. I had dinner with one farmer that said land is selling in his region for up to $10,000 per acre. That kind of price will do a lot to constrict expansion. I think this issue of size is what really makes the differences interesting. The size difference directly impacts the development of agricultural policy and farm assistance programs across the country. Smaller farms also lead to smaller fields which affects land management. The way that you manage a 4000 acre field on the Blood Reserve in Alberta is different than a 80 acre field just outside Ottawa. This is what makes Canadian agriculture so diverse and challenging. 4. Larger urban influence – Farming in the Greater Toronto Area is much different than farming just outside Saskatoon or Calgary or Winnipeg. The impact of urban population on agriculture is dramatic. This year a law was passed banning all urban pesticide use. Farmers are very concerned that this is the thin edge of the wedge and banning agricultural pesticides could be next. Agriculture has real roots in areas like London and Guelph, but otherwise the urban centers have no really business connection to the farming world around them. Although the west is moving this way, the larger western cities still have some attachment to agriculture in the sense they still drive the economy in the surrounding area. 5. Main crop types – Ontario is wall to wall corn and soybeans, while the west is mainly wheat and canola. Ontario does have a fairly large crop of winter wheat, by Ontario standards, and a small amount of canola, but driving around the province you see how dominant the corn-soy rotation has become. I live in a major corn growing area in Picture Butte, Alberta, but it is nothing like Ontario where in some areas all you can see it corn. I think the fact that Canada can produce many different crops is what makes it quite unique in the global agricultural arena. Traveling to Ontario, you begin to realize the challenge Gerry Ritz and his team have in managing the differences between east and west. Add B.C. and Quebec into the mix, and the challenge becomes that much greater. Canada is a large country, which can be a hindrance or strategic advantage. The cool thing about traveling in Canada is that whether you are in London or Lethbridge, agriculture is a very warm community of people that share the common bond of trying to feed the world. Thank you Ontario for the great visit. Nice piece here, I thought you might enjoy this piece about the differences in Ontario farm country. I’ve spoken in Peace River and I sure got to know the differences as well. Great to hear from you Philip. Thanks for visiting the site. Great article Shaun. My travels to Ontario this summer found many of the same comments. Like you mentioned the farm size and the urban (and rural) sprawl was very different from what I am used to. It was fascinating to see the differences in the cropping systems and the livestock handling. If you really want to see the differences between the West and the East with regard to Canadian agriculture, go to Quebec. In fact, I’d say Quebec agriculture is distinct from almost anything in North America, right down to the farmer psyche. I’ve worked there in the past, as well as helped lead the big 2006 protest on Parliament Hill with the UPA. It reinforced the fact to me that when Quebec agriculture flexes its muscles, everybody listens especially the federal government and other farm groups specifically in Ontario. I believe the language barrier keeps a wall up between Quebec farmers and the rest of us. To be a Quebec farmer is to feel something in your soul, something lacking at least for the Ontario farmer. Needless to say, when I was speaking in Alberta, I told the AAAF that maybe the next time they should invite a Quebecer. In rural Alberta that would really be an infusion of different ideas. Good article Sean. I sold a Cimbria Delta Cleaner and Stoner down there recently and I’ve gotten the opportunity to learn some of the same things. It doesn’t seem like Canada it is so different. It’s beautiful country in the Chatham/Kent area when you get off the 401. Having grown up in small town southern MB, selling equipment all over the country and learning how diverse Canadian Agriculture is makes my job fun. Keep up the good work and I look forward to your next email. Rod.